Annia Galeria Faustina Minor (Minor is Latin for the Younger), Faustina Minor or Faustina the Younger (born probably 21 September c. 130 CE, died in winter of 175 or spring of 176 CE) was a daughter of Roman Emperor Antoninus Pius and Roman Empress Faustina the Elder. She was a Roman Empress and wife to her maternal cousin Roman Emperor Marcus Aurelius. She was held in high esteem by soldiers and her own husband and was given divine honours after her death. Faustina, named after her mother, was her parents' fourth and youngest child and second daughter; she was also their only child to survive to adulthood. She was born and raised in Rome. Her great uncle, the emperor Hadrian, had arranged with her father for Faustina to marry Lucius Verus. On 25 February 138, she and Verus were betrothed. Verus’ father was Hadrian’s first adopted son and his intended heir; however, when Verus’ father died, Hadrian chose Faustina’s father to be his second adopted son, and eventually, he became Hadrian’s successor. Faustina’s father ended the engagement between his daughter and Verus and arranged for Faustina's betrothal to her maternal cousin, Marcus Aurelius; Aurelius was also adopted by her father. In April or May 145, Faustina and Marcus Aurelius were married, as had been planned since 138. 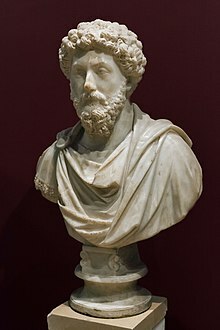 Since Aurelius was, by adoption, Antoninus Pius' son, under Roman law he was marrying his sister; Antoninus would have had to formally release one or the other from his paternal authority (his patria potestas) for the ceremony to take place. Little is specifically known of the ceremony, but it is said to have been "noteworthy". Coins were issued with the heads of the couple, and Antoninus, as Pontifex Maximus, would have officiated. Marcus makes no apparent reference to the marriage in his surviving letters, and only sparing references to Faustina. Faustina was given the title of Augusta on 1 December 147 after the birth of her first child, Domitia Faustina. When Antoninus died on 7 March 161, Marcus and Lucius Verus ascended to the throne and became co-rulers. Faustina then became empress. Aureus of Antoninus Pius, struck at the Rome mint, dated c. 147–152. Obv: Bust of Faustina the Younger. Rev: Goddess Concordia standing. Not much has survived from the Roman sources regarding Faustina's life, but what is available does not give a good report. Cassius Dio and the unreliable Augustan History accuse Faustina of ordering deaths by poison and execution; she has also been accused of instigating the revolt of Avidius Cassius against her husband. The Augustan History mentions adultery with sailors, gladiators, and men of rank; however, Faustina and Aurelius seem to have been very close and mutually devoted. Faustina accompanied her husband on various military campaigns and enjoyed the love and reverence of Roman soldiers. Aurelius gave her the title of Mater Castrorum or ‘Mother of the Camp’. She attempted to make her home out of an army camp. Between 170–175, she was in the north, and in 175, she accompanied Aurelius to the east. That same year, 175, Aurelius's general Avidius Cassius was proclaimed Roman emperor after the erroneous news of Marcus's death; the sources indicate Cassius was encouraged by Marcus' wife Faustina, who was concerned about her husband's failing health, believing him to be on the verge of death, and felt the need for Cassius to act as a protector in this event, since her son Commodus, aged 13, was still young. She also wanted someone who would act as a counter-weight to the claims of Tiberius Claudius Pompeianus, who was in a strong position to take the office of Princeps in the event of Marcus’s death. The evidence, including Marcus's own Meditations, supports the idea that Marcus was indeed quite ill, but by the time Marcus recovered, Cassius was already fully acclaimed by the Egyptian legions of II Traiana Fortis and XXII Deiotariana. "After a dream of empire lasting three months and six days", Cassius was murdered by a centurion; his head was sent to Marcus Aurelius, who refused to see it and ordered it buried. Egypt recognized Marcus as emperor again by 28 July 175. Faustina died in the winter of 175, after an accident, at the military camp in Halala (a city in the Taurus Mountains in Cappadocia). Aurelius grieved much for his wife and buried her in the Mausoleum of Hadrian in Rome. She was deified: her statue was placed in the Temple of Venus in Rome and a temple was dedicated to her in her honor. Halala’s name was changed to Faustinopolis and Aurelius opened charity schools for orphan girls called Puellae Faustinianae or 'Girls of Faustina'. The Baths of Faustina in Miletus are named after her. ^ Levick (2014), p. 137, gives her date of birth as 11 or possibly 10 or 9 days before the Kalends of October, i.e. 21, 22, or 23 September. ^ Levick (2014), p. 170, gives the year of her birth as 130–132. ^ Levick 2014, p. 172. ^ Levick 2014, pp. 170. ^ Birley 2000, pp. 90–91. ^ "Antoninus Pius", Historia Augusta, 10.2 , qtd. and tr. (Birley 2000, p. 91). ^ Birley 2000, p. 91. ^ Levick 2014, pp. 63, 170. ^ a b Birley 2001, p. 184. ^ a b Smith 1870, p. 441. ^ a b Birley 2001, p. 185. ^ a b Birley 2001, p. 189. Birley, Anthony R. (2000). Marcus Aurelius: A Biography. ISBN 0415171253. Birley, Anthony (2001). Marcus Aurelius: A Biography. Roman Imperial Biographies. London and New York: Taylor & Francis e-Library. ISBN 978-0-415-17125-0. Minaud, Gérard (2012). "Ch. 8, La vie de Faustine, femme de Marc-Aurèle". Les vies de 12 femmes d’empereur romain - Devoirs, Intrigues & Voluptés (in French). Paris: L’Harmattan. pp. 189–210. Priwitzer, Stefan (2008). Faustina minor – Ehefrau eines Idealkaisers und Mutter eines Tyrannen quellenkritische Untersuchungen zum dynastischen Potential, zur Darstellung und zu Handlungsspielräumen von Kaiserfrauen im Prinzipat. Tübinger althistorische Studien, 6. Bonn: Dr. Rudolf Habelt. Smith, William (1870). Dictionary of Greek and Roman Biography and Mythology. Wikimedia Commons has media related to Faustina Minor. "Faustina, Annia" . Encyclopedia Americana. 1920. p. 68. "Faustina, Annia Galeria" . Encyclopædia Britannica. 10 (11th ed.). 1911. p. 213. "Faustina II". Livius. 28 July 2013. Retrieved 18 August 2018. "Roman Empire: Faustina Junior (II) (Annia Galeria Faustina)". www.forumancientcoins.com. Archived from the original on 5 January 2007. "DIR Marcus Aurelius". Roman Emperors. 30 January 2001. Retrieved 18 August 2018. "Huge Roman Bronze Sestertius of Diva Faustina Coin Pebdant". www.johnbmcnamara.com. Archived from the original on 9 December 2006. 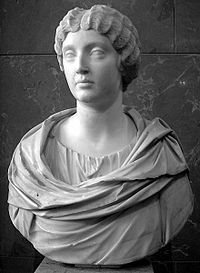 "Faustina The Younger". The Collaborative Numismatics Project. Archived from the original on 6 July 2017.